While we tend to be very quiet around here we felt Education Freedom Day was a very good opportunity to try to contribute to Educational Resources. So we have decided to try to add a Khmer translation to RUR-PLE, which teaches kids how to program using Python. The application comes with 48 complete lessons and is used in many schools around the world. The translation process is described here and involves translating the applications and the lessons (two different processes). While we are very much aware that it will take more than a day, it is a good starting point to provide Cambodian people with a cross platform application to brush up their computer skills. The event will happen online on Saturday, January 18th and we will be hanging out on #efday channel on freenode. You can join us either using the freenode webchat interface, or your favorite IRC client. See you there! Celebrate Hardware Freedom Day 2013! The newly Hong Kong registered charity (charity status pending approval) Digital Freedom Foundation (formerly known as SFI) is proud to announce the launch of Hardware Freedom Day on April 20, 2013. Focusing a lot on all the hackerspaces around the world, but not only, HFD aims to spread the word about Open Source Hardware in our local communities and encourage more people to explore the limitless opportunities of sharing creativity, hacking skills and knowledge. Tightly connected with Free Software, HFD celebration comes as a great complement with the very famous Software Freedom Day celebration which has been running since 2004. Hardware hacking is obviously not unknown to the PPLUG whose meetings are now managed by the Phnom Penh Hackerspace! So if you're into Open Source Hardware don't wait, go create your wiki page and register your event right now! It is with great pleasure that the Phnom Penh GNU/Linux User Group wishes you a happy Khmer New Year and hopes we will continue striving for another year. Remember to come and visit us during our regular meet ups on Tuesdays evening at the Phnom Penh Hackerspace where you'll be able to meet other people interested in Linux, GNU, Free Software and hardware hacking as well. Meetings are free and a great place to ask questions and discover new tricks. All the best for 2012 (or 2555 isn't it?)! Thanks to Rick's message we were informed the site registration was broken. It was actually a problem with the new captcha, set up to prevent all the spam we were getting in the forum. Also with the latest Joomla! upgrade (2.5.1) the right side module combining forum, planet feed and the login box broke. Omega Theme provided a fix within less than 30 hours which is really amazing and makes us very happy to be using their products on this website. So all in all, all the newly discovered issues have been fixed and you should all be able to use the website as planned. Should you still have problems, please report them in the forum specific section or eventually the mailing list. After a few months of interuption due to an unlucky (and not backed up) update we have finally taken the time to fix our website! And since we were really slow to react we had to bring a few extra goodies as well, didn't we? So we also fully upgraded the site to the next version of Joomla!, added a new extension to stop the spam which was starting to invade the forum and switch to a totally different look! Hopefully we are now forgiven and we are looking forward to getting first impressions in the forum. Thank you all for your patience. Starting from December 28th 2010, Phnom Penh LUG will meet at the newly opened hackerspace. So no more Freebird, and full sped towards hacking and fiddling with interesting new projects! On a side note, Thursday December 30th, the Phnom Penh hackerspace is having a movie night at 7pm sharp: "The Scoial Network". Great way to meet new people who share similar interests! While the Phnom Penh LUG meets every week almost, we don't have much news to talk about. 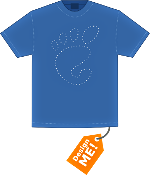 Even if most of our discussions happen off-line, we're happy to inform you that the GNOME Foundation is launching a T-shirt design competition to prepare for the launch of GNOME 3.0. If you have some imagination or great ideas, then it's probably the time to fire up Inkscape (or you preferred design application) and give it a try. First prize entitles you for U$100 and 2 T-shirts of your own design, though we all know no one does it for the money! On a side note, GNOME is also updating its Friends of GNOME program with new benefits, so even if you don't code you can always help to make GNOME better. The money collected is used for different causes such as providing travel subsidies to speakers at conferences and hackfests, which some of our Phnom Penh LUG members have benefited to get to GNOME.Asia last year, or outreach programs giving some marketing and coding tasks to students. Should you want to know more about the various GNOME Foundation efforts, the Foundation reports is a good start. Software Freedom Day has just opened registration for 2010 teams to get free goodies to prepare their event. For those not familiar with SFD, it's an annual event happening on the third Saturday of September (September 18th this year) which purpose is to reach out to the public to educate, discuss and demonstrate the virtues and benefits of Free Software. With around 800 locally managed events in 2009, SFI (the non-profit organization behind SFD) hopes to reach more than a thousand teams this year and hundreds of thousands of people. Indeed within less than 24 hours, there are already over 100 teams registered! Cambodia has already one team registered, the Clogger group. So guys and gals from Cambodia (not only Phnom Penh), please do step up and consider talking about SFD in your town! It is with great pleasure that we're going to host the website and discussion forum for Moonos as their current free host is proving not reliable enough. Moonos is a lightweight Linux distribution maintained by our famous local hero Rithy and optimized for the Khmer language. The site is being installed at the moment and we'll get you updated with more news as the project gets familiar with its new home. PPLUG is definitely honored to be able to contribute to a Cambodian originated Linux and Open Source project! Come and meet the PPLUG every Tuesday @ Freebird! The Phnom Penh Linux User Group currently meets weekly in an very informal way every Tuesday at Freebird Café on Street 240 from 6PM onwards. We usually do have topics to discuss and the best way to keep updated on those is to look at our mailing list. So if you're curious, interested or passionate about Linux and what's happening in Phnom Penh on the Open Source front, this is the place to be! After a few months of discussion over our mailing list we've finally come to actually resolve all the issues surrounding having our own presence on the web! So now people living in Phnom Penh and having an interest in Linux and wanting to meet up with similar minds can join us by registering on our mailing list and introducing themselves. Furthermore we plan on operating a bilingual website and will need volunteers to help us translate our content into Cambodian or English (depending on which language the original article is written in). The best way to do that is to register both at the website and the mailing list and let yourself known. The site is still in its early moments and graphics, content and functionalities are bound to change. We're hoping that our small community will take enough interest in the project and contribute to make it answer our needs. Thank you all and looking forward to hearing from you!